Why get your dryer vents serviced? And the number continues to rise. Why? Most people don’t know their dryer vents need to be cleaned. They clean out their lint filter now and then and think that’s it. But the dryer vent duct is where lint can really build up and get clogged. 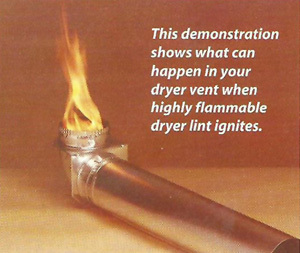 And lint is highly flammable, accounting for most dryer vent fires. In addition to lint buildup, improper installation of your dryer vent system can also pose a serious danger to you. A dryer vent cleaning professional will detect potential hazards such as the presence of flammable vinyl duct or a duct run that is improperly routed. So ensure your family’s safety with a professional inspection. 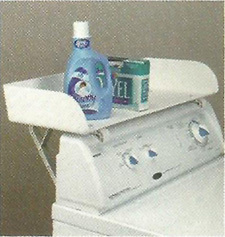 If your dryer isn’t drying your clothes like it used to, you may not need a new dryer! 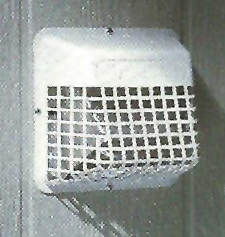 A dryer vent clogged with lint reduces airflow so your dryer dosen’t dry as efficiently as it used to. An inefficient dryer also uses more energy thereby costing you more money. Have your dryer vent system cleaned and inspected yearly by a dryer vent cleaning professional. 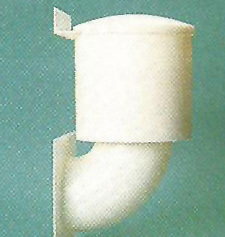 A standard cleaning will involve unhooking the dryer, cleaning the vent duct with special tools, and checking connections. A professional can also service all venting situations, including today’s extremely long vent ducts. These ducts are especially susceptible to lint buildup. So don’t take a chance! Put your family’s safety in the hands of a professional. It will protect them against potential fire and save you money as well! Organizes all your laundry supplies in one convenient place. This sturdy plastic shelf holds up to 20 pounds! The shelf measures 27″ long, and 10.5″ deep. Save on energy bills by keeping cold air out in the winter and hot out in the summer. Durable plastic can be painted to match the color of your home. Keep unwanted critters from entering your dryer vent!